Mahi mahi is a widely distributed fish, found in most tropical and subtropical regions. They are fished commercially throughout their range. Mahi mahi are managed by the National Marine Fisheries Service and the South Atlantic Fishery Management Council. Mahi mahi are no longer managed by the Gulf of Mexico Fishery Management Council. Some regulations are in place such as size limits. Mahi mahi have not been fully assessed in the Atlantic but it is thought that their population is stable. Handlines and trolls cause the bycatch of other species such as yellowfin tuna and swordfish. Mahi mahi handlines and trolls cause low levels of bycatch. Sharks are occasionally caught but can be released quickly which minimizes capture mortality. Troll fisheries and handlines do not come into contact with the seafloor, and therefore have minimal habitat impacts. Mahi mahi is a widely distributed fish, found in most tropical and subtropical regions. They are fished commercially throughout their range. Mahi mahi are managed by the National Marine Fisheries Service and the South Atlantic Fishery Management Council. They are no longer managed by the Gulf of Mexico Fishery Management Council. Management in the US is moderately effective as measures have been implemented to protect sea turtle bycatch. Mahi mahi have not been fully assessed in the Atlantic but it is thought that their population is stable. Longlines cause the bycatch of several species including other fish, sharks, sea turtles, and marine mammals. However, they do not come into contact with the seafloor, and therefore have minimal habitat impacts. Mahi mahi is a widely distributed fish, found in most tropical and subtropical regions and are fished commercially throughout their range. Management of Mahi mahi in the Eastern, North and South Pacific Ocean is conducted by the Inter-American Tropical Tuna Commission. No management measures are in place for mahi mahi in this region. Management is lacking in regards to the regulations around bycatch levels. Mahi mahi in the North and South Atlantic are managed by the International Commission for the Conservation of Atlantic Tunas (ICCAT). Although the ICCAT addresses sea bird interactions, management is lacking regarding the protection of sea turtles. Mahi mahi in the Indian Ocean and Western Central Pacific Ocean are managed by the Ministry of Marine and Fisheries Affairs (Indonesia), the Aquatic Resources Authority of Panama (Panama), the Fisheries Authority Council of Agriculture (Taiwan) as well as the Western and Central Pacific Fisheries Commission and the Indian Ocean Tuna Commission. Management of the mahi mahi stock and its bycatch is ineffective both domestically and regionally. In Panama, although some management regulations to protect sea turtles exist, these are insufficient to conserve the species. The status of mahi mahi in the Eastern Pacific Ocean is unknown. Mahi mahi have not been fully assessed in the North or South Atlantic but it is thought that their population is stable. The status of mahi mahi in the Indian Ocean and Western Central Pacific Ocean is unknown because limited stock assessments have been conducted. In the Pacific, Western Central Pacific, Indian, and Atlantic oceans, longlines catch a large number of bycatch including tunas, billfish, bony fish, sharks, sea turtles and seabirds. Olive ridley turtles are also caught in the Indian Ocean. Longlines do not come into contact with the seafloor, and therefore have minimal habitat impacts. However, the longlines capture exceptional species i.e. species whose importance to the ecosystem is disproportionately large. Mahi mahi is a widely distributed fish, found in most tropical and subtropical regions. They are fished commercially throughout their range. Mahi mahi have life history characteristics that make them inherently only moderately vulnerable to fishing pressure. The status of mahi mahi in the Eastern Pacific Ocean is unknown. Mahi mahi in the Eastern Pacific Ocean is conducted by the Inter-American Tropical Tuna Commission. No management measures are in place for mahi mahi in this region. Management is lacking in regards to the regulations around bycatch levels. Compared to associated purse seines which use fish aggregating devices, the unassociated purse seines cause less bycatch. Nevertheless, manta rays and sharks which are threatened species are still caught in the unassociated purse seines. Purse seines do not come into contact with the seafloor, and therefore have minimal habitat impacts. Mahi mahi is a widely distributed fish, found in most tropical and subtropical regions. They are fished commercially throughout their range. Mahi mahi in the Eastern Pacific Ocean is conducted by the Inter-American Tropical Tuna Commission. No management measures are in place for mahi mahi in this region. Management is lacking in regards to the regulations around bycatch levels. 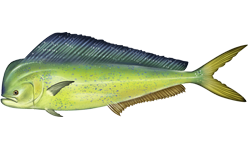 Mahi mahi in the North and South Atlantic are managed by the International Commission for the Conservation of Atlantic Tunas. Although the ICCAT addresses sea bird interactions, management is lacking regarding the protection of sea turtles. Mahi mahi have life history characteristics that make them inherently only moderately vulnerable to fishing pressure. The status of mahi mahi in the Eastern Pacific Ocean is unknown. Mahi mahi have not been fully assessed in the North or South Atlantic but it is thought that their population is stable. In the Pacific and Atlantic oceans, FAD purse seines catch a large number of bycatch including tunas, sharks, finfish and sea turtles. The bycatch of silky and oceanic white tip sharks as well as the sea turtles is of serious concern. Purse seines usually do not come into contact with the ocean floor and therefore have minimal habitat damage. However when FADs are used, they are sometimes anchored to the bottom.